David Schlumpf as Buddy the Elf and the ensemble of “Elf the Musical” at Olney Theatre Center. Photo by Stan Barouh. Did you know that “The best way to spread Christmas Cheer, is singing loud for all to hear.” Well, that is what Buddy the Elf says in the show called “Elf The Musical” which is now playing at the Olney Theatre Centre through January 6th. Director Michael J. Bobbitt continues to deliver high-quality entertainment for the entire family. Mr. Bobbitt has a knack for bringing together the finest of performers and production teams, and Olney’s “Elf The Musical” is no exception. Based upon the 2003 film called “Elf” starring Will Ferrell, the story is about Buddy, a young human orphan who mistakenly crawls into Santa’s bag of gifts and is transported to the North Pole. Raised as an elf, Buddy always feels out of place. He is much taller than all the other elves and is not a good toy maker. In fact, Buddy calls himself a “cotton headed ninny muggins!” When the truth is revealed that he is a human, Santa sends Buddy on a journey to NYC to discover his birth father and to learn more about what it means to be human. …high-quality entertainment for the entire family. The book by Thomas Meehan (“Annie,” “The Producers,” “Hairspray”) and Bob Martin (“The Drowsy Chaperone”) is faithful to the original film version while giving it a dash of their own holiday spice and everything nice. The writers succeed because they understand how to relate to today’s audience. Situations that include texting, ipads, and cell phones make it all the more current and comical. Of course what really sets this show apart from the movie is that this is a musical. The songs by Matthew Sklar and Chad Beguellin (“The Wedding Singer”) feature a generic Broadway-style score. The song called “Sparklejollytwinklejingley” seemingly tries to copy the idea of having a fun, invented long word like the song “Supercalifragilisticexpialidocious” from Walt Disney’s “Mary Poppins” by the Sherman Brothers. While both words are fun to say, “Sparklejollytwinklejingley” still manages to sound generic and is forgettable like the rest of the songs. That doesn’t mean, however, that the songs are not entertaining. For me, the song highlight is “Nobody Cares About Santa,” which is about a group of fake Santas at the Chung Fu Palace restaurant complaining how people no longer have the Christmas spirit. Elf agrees with the Santas saying, “Even little children think that Santa’s overrated. 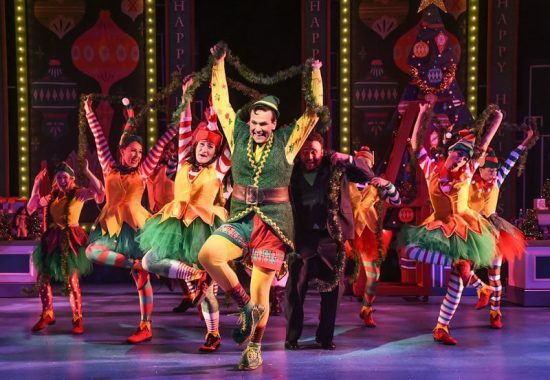 I kinda get the feeling that New York is jaded.” Tara Jeanne Vallee’s snazzy and lively choreography caused many audience members to tap their toes in their seats while the Santa’s danced with passion. Actor David Schlumpf is full of child-like wonder in his role as Buddy, an elf whose mission is to bring the magic of Christmas back to New York. His romantic interest, Jovie (Played by a jaded, yet vulnerable Patricia Hurley) who works with Buddy at Macy’s is depressed because the holiday reminds her of her past romantic failures. An important part of the story involves Walter Hobbs (Played believably by Bobby Smith) who works at a children’s book publishing company and is Buddy’s biological father who happens to be on the naughty list. Is the support and encouragement of Buddy, Walter’s wife Emily (a warm Janie Sunday), and son Michael (a bright Eli Langer) enough to make him understand the importance of family? And what would a Christmas musical be without Santa? Besides his incredible vocal chops, Kevin McAllister adds sincerity, heart, and humor in his role as Santa. Nova Y. Payton as Deb, the secretary is bursting with charisma, adding life and joy to the stage. Production elements such as the colorful, bright and cheery costumes designed by Kendra Rai, the tuneful orchestra conducted by Angie Benson, and the imaginative set designed by Daniel Ettinger, helps to put everyone into the holiday spirit. “Elf the Musical” plays through January 6th, 2018, at the Olney Theatre Center – 2001 Olney-Sandy Spring Road, in Olney, MD 20832. 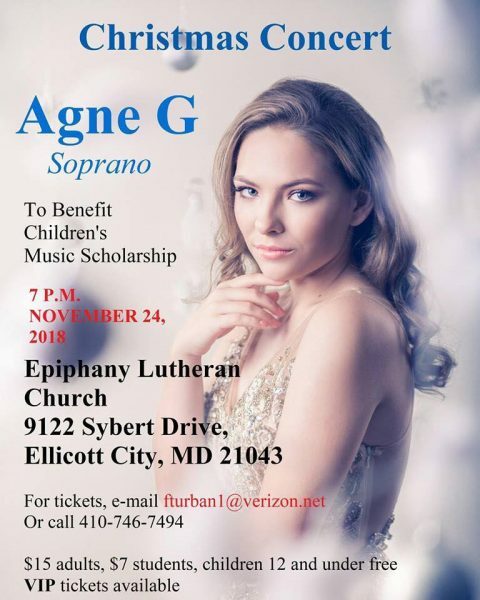 For tickets, call the box office at (301) 924-3400 or purchase them online.